Did you know that camels are social animals? Unlike your cousin Pam, camels love to be around others! Also unlike your cousin Pam, camels are also super peaceful animals who rarely exhibit aggression. And, contrary to popular misconception, camels actually do not store water in their humps…the humps are actually reservoirs for fatty tissue: Concentrating fat in their humps minimizes insulation throughout the rest of the body, thus allowing camels to survive in extremely hot regions like the desert! Here’s some more “Well, actually…” facts you can throw out when you’re wearing this Adult Ride In Camel Costume: Baby camels are born without humps, Arabian camels only have one hump, and Asian camels have two. Mother and child camel pairings are extremely close, staying together for several years (insert Mama’s Boy joke here). In Arab cultures, the camel often symbolizes patience, tolerance, and endurance. In fact, camels are such a big deal in Arabian culture that there are over 160 words for “camel” in the Arabic language! All of which is to say: Camels are freakin' cool. And you know what's even cooler? 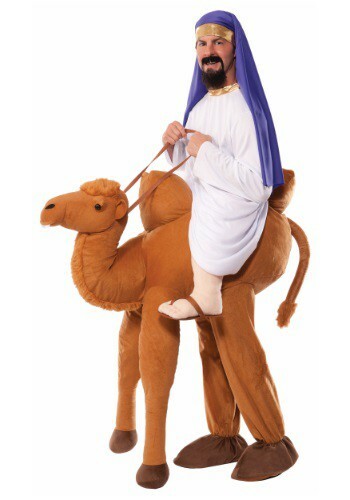 This Adult Ride in Camel Costume! Trust us...if you want to wow everyone at your next Halloween or costume party, this is the costume to ride in on! Much like seeing an oasis in the middle of the desert, the whole thing is built on an illusion: Your legs go into the camel's hind legs, and the camel's front legs and the "rider's" legs are stuffed! It's also got elastic shoulder straps hold the bull's body in place. Get yourself a robe and headdress (the ones shown here are not included) and you’ll be ready to lead your caravan right into costume party paradise!